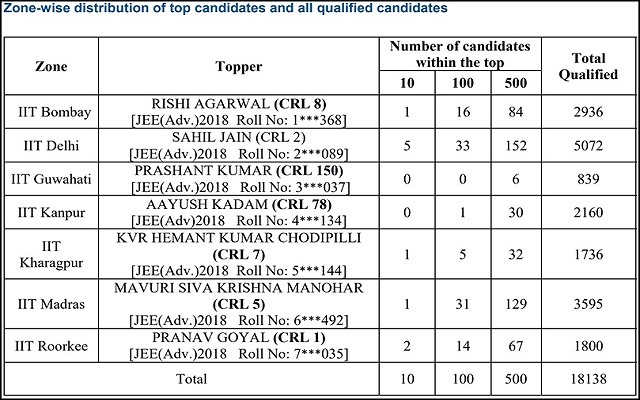 JEE Advanced 2018 results were announced on June 10, 2018, and a total of 18138 candidates have qualified for the seat allocation process. Although, this year the number of eligible candidates appearing in the JEE Advanced have increased, even then also the number of qualified candidates has dropped. The qualified candidates will be able to participate in JEE Advanced 2018 Counselling which will begin from June 15, 2018. Joint Seat Allocation Authority (JoSAA) will be organising the seat allocation process. To participate in the JoSAA 2018 seat allotment process, the qualified candidates need to register in online mode only. Through JoSAA 2018, seat allotment will be done at the IITs, NITs, IIITs (Triple‐I‐Ts) and Other‐GFTIs. In this article, students can check the complete counselling schedule of JEE Advanced 2018 and seat allotment procedure. Step 1: Registration and Online Choice filling: Candidates participating in the JoSAA seat allotment process need to register their basic details such as gender, state code of eligibility and nationality, and provide their contact details. Also, they need to fill their choices for courses/branches of engineering and Institutes from the list provided along with JoSAA registration form only. Step 2: Mock Seat Allotment: JoSAA will publish 2 mock seat allotment lists as per the choices filled by candidates. Candidates can lock their choices or change it also for final seat allotment. Step 3: Seat Allotment rounds: After the registration and choice-filling process has been completed, JoSAA will release the first seat allotment list. And similarly, there will be six more rounds of seat allotment. The candidates will be issued seat allotment letter and e-challan for seat acceptance. To confirm a seat, candidates need to visit the allotted reporting centres. There will be seven rounds of seat allotment by JoSAA. Step 4: Document verification and admission fee payment: To accept the allotted seat, candidates need to visit the reporting centres and get their documents verified and pay the admission fee. The reporting time at the centres is from 10:00 am to 05:00 pm. Candidates who want to confirm their admission(seat allocation) must visit the reporting centre in person or their admission will not be confirmed. Step 5: Withdrawal of admission: Candidates can withdraw admission from their seat allotted to them by visiting the reporting centre in next round of JoSAA seat allotment 2018. The candidates can also participate in next round of counselling and also they will have to pay seat cancellation fee. Moreover, the choice of admission withdrawal is available till round 6 of JoSAA seat allotment process 2018 only.